Since we had been denied the summit of Mt. Washington earlier this year, I wanted to go back and try it without snow, fairly certain that the avalanche conditions would be much more palatable! Troy Colyer and I caught the 7:30 ferry (just barely, due to some miscommunication), and had a small breakfast while checking out the route description in the guide book on the way over to Bremerton. I remembered most of the driving instructions well enough that the drive to the trailhead was completely uneventful, and we were able to park at the trailhead this time, rather than 2 miles away at the lower Mt. Ellinor trailhead, as we had to back in April (due to snow). The trail (really more of a climber's path) starts out steep and stays that way, gaining 3200' in just 2 miles! 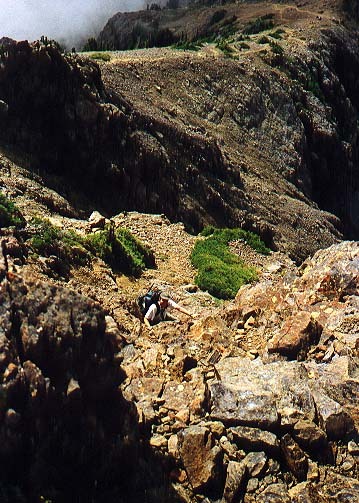 Although it's steep, following the path proved fairly straightforward in most places, although now and then the trail would fan out, and the easiest path was not always obvious. Just below a small benchy meadow we took one of the less traveled paths, and ended up working our way up a rocky sided gully. As we approached the upper neck of the gully, I decided to try scrambling up the ledgy gully wall on our left - what fun! It laid back at an inviting angle, and the texture on the rock made for very pleasant scrambling - certainly much more enjoyable than pushing our way through the brush choked upper reaches of the gully! Once to the top of the short rock wall, we walked out onto a lovely flat area, and I recognized it as the same area that we reached on our April climb. We stopped here then, and watched as the mountain sloughed its coat of snow down chutes and gullies. Today, there was nothing but sunshine and warm rock, and the way ahead was obvious. We heard some calls from another party just north of us - it was difficult to understand them, but eventually we puzzled out that they wanted to know if they were off route. Well, I suppose that all depends on which route you're on, but I was guessing they were trying the same route as we were, so I told them they should work our way. We continued on up to the top of the meadow, and then followed a boot path through some rock boulders and onto a scree slope. The path here obviously worked it way up and right, then crossed the top of a large rock outcropping - Troy followed the path, and I once again opted for the scramble route straight up the gently sloping buttress. 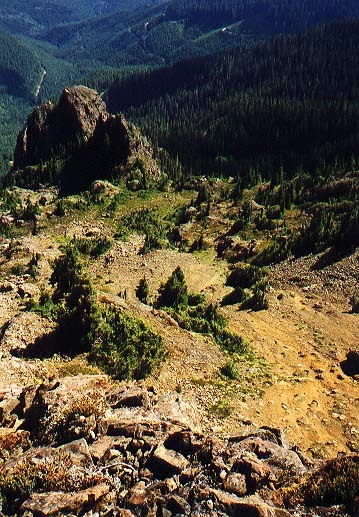 At the top of this, the path followed a large boulder closely, then turned and headed for the skyline ridge. Here we noticed some flagging on a bush that was in the general direction of where we thought the traverse route from Mt. 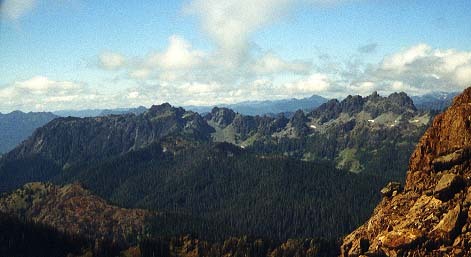 Washington to Mt. Ellinor would be. We filed that information away for the return, and headed up to the ridge. The climbers we'd given our route advice to caught up to us here, and one of them offered us some home made chocolate chip cookies for helping them out - yummy! We chatted with them for a bit, then headed along the ridge towards the summit. the obvious way meanders around some rocky outcroppings on the ridge, finally arriving at a choice in routes. There's a path that works its way right, heading up to the true summit after circling under a short headwall, and there's a fun scramble route that allows you to 3rd class the headwall, then scramble over to the true summit - we choose the scramble of course! It was only 20 or 30 feet, and on mostly sound rock - all the hand holds and foot holds were deservedly tested, however. After arriving on the summit, we grabbed some lunch and started shooting some pictures. We'd been ascending through some light clouds, but now as we sat on the top of Mt. Washington, the clouds for the most part evaporated and blew away. To the east, from north to south, we were able to see Mt. Baker, Glacier Peak, Mt. Rainier, Mt. Adams and Mt. St. Helens - I've never been able to see all the Washington Cascade volcanoes at once before - very impressive! North of us we could see just a bit of the Brothers, and west we could see the ridge we wanted to traverse over to Mt. Ellinor. The route didn't look obvious, but we had plenty of time to at least give it a try. After a few more photos we headed down the class 2 route back to the ridge. 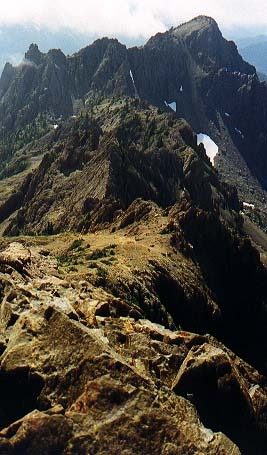 We paused to take a picture of Sawtooth Ridge, with Mt. Cruiser rising prominently from it. Then back along the ridge to where we had spotted the flagging earlier. From here we tried pushing the route west and up, but very quickly we ended up on low 5th class rock, and decided that wasn't a smart thing to be doing. Descending back to the trail, Troy's ice axe managed to work itself loose and come spearing down the rocks - fortunately no one was under him to be impaled, but it was kind of a scary sight. Also fortunately, it stopped at an easily accessible place, so he was able to retrieve it. We worked out way a bit further down, and then Troy did a little more recon work. It looked to me like he was heading out onto a sheer cliff, but after a few minutes he thought he was seeing a way that would continue west for a ways. It was mid-afternoon by now, and after talking about it for a few minutes, we decided it was getting just a bit too late to try out a new route down that we were entirely unsure of. Next time we'll try climbing Ellinor first, and doing the traverse from that side - I've heard the way is much more obvious from that direction, and once we've done it that way, the reverse trip should be much easier. Instead of exploring new routes, we headed down the way we had come, with the slope of the path reinforcing how steep the ascent had been. After getting back to the truck we took the short side trip over to the bend in the road where a beautiful waterfall is tucked back into a corner and snapped a few final pictures. I'm already looking forward to heading back here once again, climbing Mt. Ellinor, and trying for that elusive traverse one more time.